Edward Ball was born on 28th November 1891 in Rainhill. By 1901 Edward was 9 years old, living with his mother and father, Ellen and Thomas Ball at 3, Parkers Row, Rainhill. He had three sisters, Lily, 11, Gertrude, 5, and Eva Victoria, 4 and one brother Thomas, 1. Thomas, Edwards’s father, was a broach maker. By 1911 the family had moved into Gerrard Cottages off Holt Lane, Rainhill. Thomas and his family lived in the end cottage next to his workshop. There had been three additions to the family, Jane, 9, Olive, 4, and Violet, 2. Edward was listed as a day wage colliery worker. He joined the 16th Cheshire Regiment Bantams. He was a small man and had been unable to join up previously but as the War proceeded the army needed more men so Bantams became a part of each regiment. 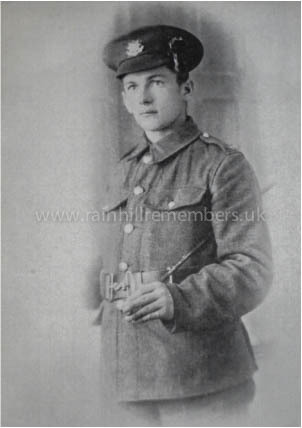 He became Private 2181 and served from 8th February 1915 till 19th March 1919. Edward was recruited by the Army in London Road, Liverpool and went for training to Rock Ferry and then to Prees Heath. His Regiment sailed from Rock Ferry and marched through Liverpool to Lime Street where they took part in a parade at St George’s Hall, Liverpool, in front of Lord Kitchener. At the end of the war he was transferred to the Reserves. In case of national emergency he was to re-join at Prees Heath. Like many men who survived the Great War Edward spoke very little about his experiences on his return home. However he did give some details to his daughter’s husband, Harry, in his later years. He talked about the time the platoon was walking along and dived into a barn for cover which unfortunately took a direct hit and he was the only survivor but he lost his small pack. Sometimes they went into the German trenches and swapped British corned beef for German cigars and he fought in trenches up to the waist in water with the Australians and thought they were real gentlemen. He also explained that the Bantams were assigned to various regiments and when they landed in Boulogne the French laughed at them and this resulted in skirmishes between the soldiers. Edward received the Victory Medal, the British War Medal and the Star Medal; from which, using the centre circle, he made a washer! In 1928, Edward married Ellen Boardman and they had two children, Edward and Lily. Edward is the father of Lily Glover who has visited the War graves in France many times.